The Spring Offensive of the German Army on the Western Front had begun on 21 March 1918 with Operation Michael and had petered out by July. The Germans had advanced to the river Marne but failed to achieve a decisive (war determining) victory. When Operation Marne-Rheims ended in July, the Allied supreme commander Ferdinand Foch ordered a counter-offensive, which became known as the Second Battle of the Marne. The Germans, recognising their untenable position, withdrew from the Marne to the north. For this victory, Foch was granted the title Marshal of France. A number of proposals were considered and Foch agreed on a proposal by Field Marshal Sir Douglas Haig, Commander-in-Chief (C-in-C) of the BEF, to strike on the River Somme, east of Amiens and south-west of the site of the 1916 Battle of the Somme, to force the Germans away from the vital Amiens–Paris railway. :472 The Somme was chosen because it remained the boundary between the BEF and the French armies, along the Amiens–Roye road, allowing the two armies to cooperate. 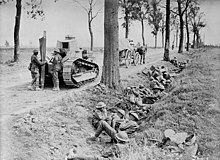 The Picardy terrain provided a good surface for tanks, which was not the case in Flanders, and the defences of the German 2nd Army (General Georg von der Marwitz), were relatively weak, having been subjected to continual raiding by the Australians in a process termed peaceful penetration. The advance continued for three more days but without the spectacular results of 8 August, since the rapid advance outran the supporting artillery and ran short of supplies. During those three days, the Allies had managed to gain 12 mi (19 km). 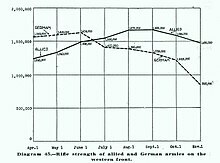 Most of this was taken on the first day as the arrival of German reinforcements after this slowed the Allied advance. On 10 August, the Germans began to pull out of the salient that they had managed to occupy during Operation Michael in March, back towards the Hindenburg Line. 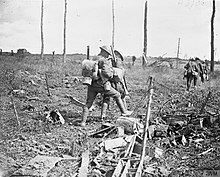 South of the BEF, the French First Army approached the Hindenburg Line on the outskirts of St. Quentin during the Battle of Savy-Dallon (10 September),:128–9 and the French Tenth Army approached the Hindenburg Line near Laon during the Battle of Vauxaillon (14 September). :125 The British Fourth Army approached the Hindenburg Line along the St Quentin Canal, during the Battle of Épehy (18 September). By 2 September, the Germans had been forced back close to the Hindenburg Line from which they had launched their offensive in the spring. 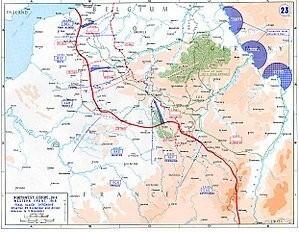 The first attack of the Grand Offensive was launched on 26 September by the French and the AEF in the Meuse-Argonne Offensive (this offensive includes the Battle of Somme-Py, the Battle of Saint-Thierry, the Battle of Montfaucon, and the Battle of Chesne of 1 November). The offensive involved attacking over difficult terrain, resulting in the Hindenburg Line not being broken until 17 October. Two days later, the Army Group under Albert I of Belgium (the Belgian Army, the British Second Army and the French Sixth Army), attacked near Ypres in Flanders (the Fifth Battle of Ypres). Both attacks made good progress initially but were then slowed by supply difficulties. On 29 September, the central attack on the Hindenburg Line commenced, with the British Fourth Army (with British, Australian and American forces) attacking in the Battle of St Quentin Canal and the French First Army attacking fortifications outside St Quentin. The American 30th Division and 27th Divisions captured the towns of Bellecourt and Nauroy. By 5 October, the Allies had broken through the entire depth of the Hindenburg defences over a 19 mi (31 km) front. :123 General Rawlinson wrote, "Had the Boche [Germans] not shown marked signs of deterioration during the past month, I should never have contemplated attacking the Hindenburg line. Had it been defended by the Germans of two years ago, it would certainly have been impregnable…." There were many casualties in the Allied and German armies. Rearguard actions were fought during the Pursuit to the Selle (9 October), Battle of Courtrai (14 October), Battle of Mont-d'Origny (15 October), Battle of the Selle (17 October), Battle of Lys and Escaut (20 October) (including the subsidiary Battle of the Lys and Battle of the Escaut), Battle of the Serre (20 October), Battle of Valenciennes (1 November) and the Battle of the Sambre (including the Second Battle of Guise (4 November) and the Battle of Thiérache (4 November), with fighting continuing until the last minutes before the Armistice took effect at 11:00 on 11 November 1918. The last soldier to die was Henry Gunther, one minute before the armistice came into effect. ^ a b Tucker 2014, p. 634. ^ a b c d Livesay, John Frederick Bligh (1919). 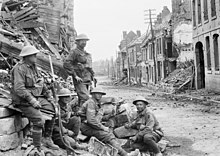 Canada's Hundred Days: With the Canadian Corps from Amiens to Mons, Aug. 8 – Nov. 11, 1918. Toronto: Thomas Allen. ^ "Canada's Hundred Days". Canada: Veterans Affairs. 29 July 2004. Retrieved 25 May 2015. ^ a b "History of the Great War – principal events timeline – 1918". Retrieved 11 June 2010. ^ "Mont St Quentin – Peronne 31 August – 2 September 1918". Archived from the original on 25 July 2008. Retrieved 11 June 2010. ^ "The Second Battles of Arras, 1918 – The Long, Long Trail". Retrieved 11 June 2010. ^ Blair 2011, pp. 145–148. Montgomery, Sir A. (1920). The Story of Fourth Army in the Battles of the Hundred Days, August 8th to November 11th, 1918. London: Hodder & Stoughton. OCLC 682022494. Retrieved 29 July 2015. Priestley, R. E. (1919). Breaking the Hindenburg Line: The Story of the 46th (North Midland) Division. London: Unwin. OCLC 671679006. Retrieved 29 July 2015. Lloyd, Nicholas: Hundred Days Offensive , in: 1914-1918-online. International Encyclopedia of the First World War.